From the "Why Am I Not Surprised?" Dep't. From the moment NBC Entertainment prexy Kevin Reilly made his hasty exit from the Peacock in late May, there was speculation that he would wind up on the Fox lot, and for good reason. Industry insiders confirmed Thursday that Reilly is in talks to join Fox in a role that is expected to have him sign on as head of programming, while the current occupant of that job, Peter Liguori, takes on a broader role overseeing the network. Why waste time with all of this mergey stuff. Why not just let one person run everything in the world. Oh, wait. Cheney's already doing that. Reilly might report to Liguori, or Liguori and Reilly could share a title (co-heads are all the rage around H'wood these days, especially at News Corp., which has two-headed toppers at both its film and TV studios). There are so many "two-headed topper" jokes I could make. But this is fundraising week, and I don't want to sully Cliff's good name. 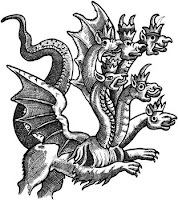 I'll just go with the much safer, yet still snark-laden Hydra-and-its-poisonous-fumes reference and leave it at that. I can't seem to stop finding things to post about. Padlock, I hope you're taking advantage in a realllly long, relaxing bath right now. I hope you never stop finding things to post about. As long as you use words like 'snark', keep 'em coming.